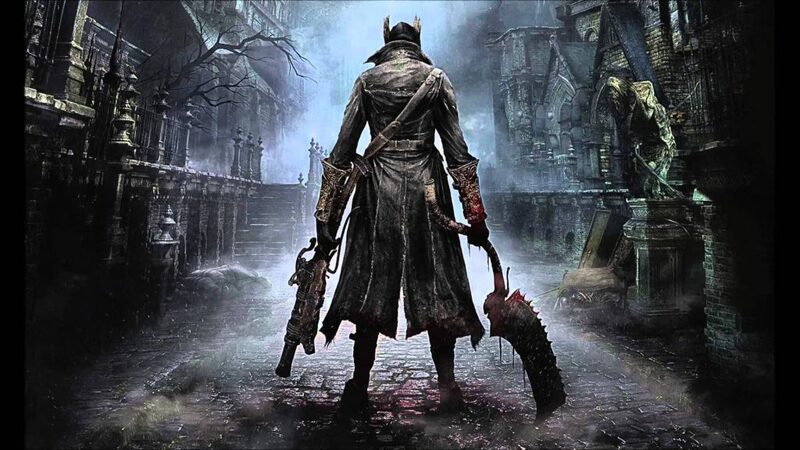 I picked up Bloodborne on PS4 last year and was blown away by the games level design. As I mentioned in an earlier blog, games with “hub” style levels are a particular favourite of mine to play and dissect. 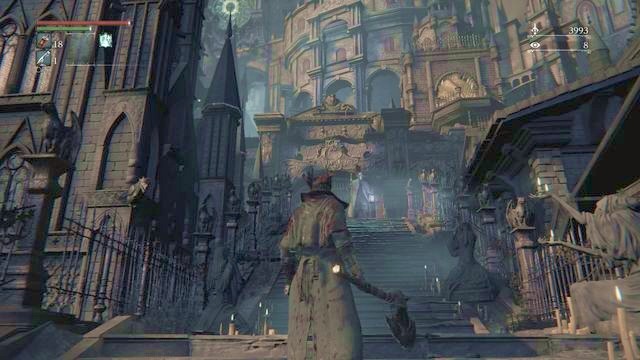 In Bloodborne, the levels serve as much more than a simple backdrop to the action. Each level is a system in itself, almost perfectly in tune with the progression systems at the core of the game. As the player progresses forwards into unknown territory, each new encounter is a huge risk. One misstep and you die (you will die), potentially losing all the souls you’ve collected. The levels are built in such a way as to entice you to eek that little bit further forward. If you reach a lantern, you can teleport back to your hub and spend your souls on upgrades to prepare for the NEXT level. 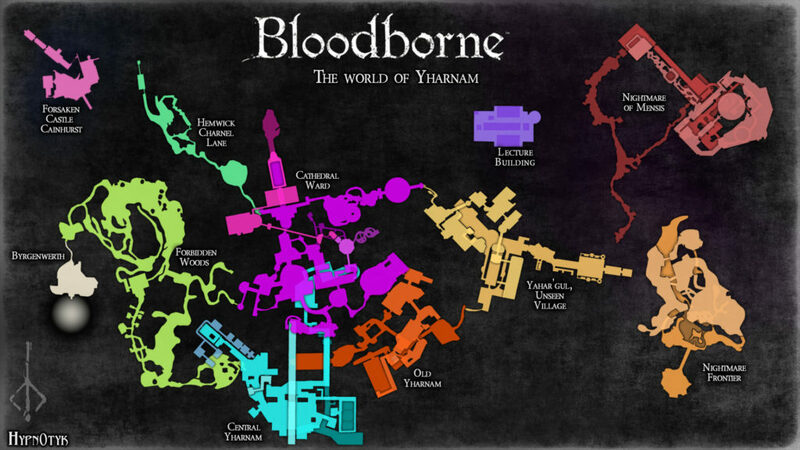 Yharnam map courtesy of “u/Hypnotyks” on Reddit. The levels are also designed to include multiple routes through, and there are no markers or escorting NPCs to lead the way. All player leading is done through the environment, the player is at the mercy of their own intuition and intrigue, which is shaped by the environment. Distant cathedrals can be spotted across vast vistas, drawing the player in their direction. Alleyways and tight corridors slow players down as there could be any manner of enemy around the next corner (there will be). Walkways that cross over previously explored areas remind you of how far you’ve come and convince you the next lantern is just around the next corner! At first, levels feel like a maze. 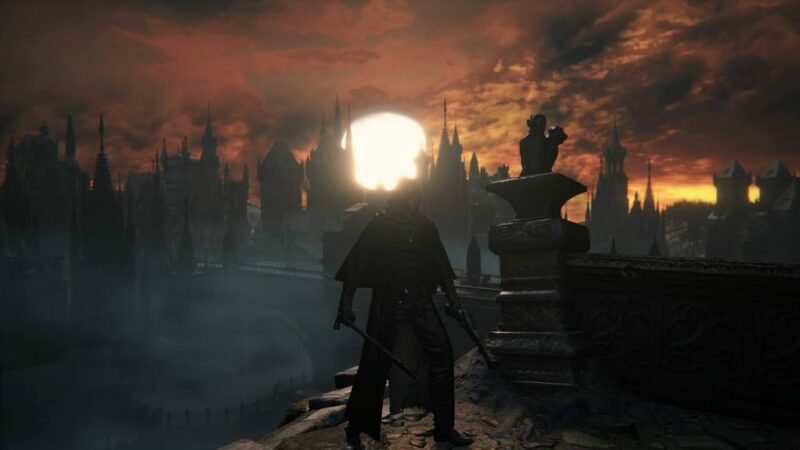 However, the nature of Bloodborne (and the “Souls” series in general) is to teach through re-play rather than explicit direction. As players progress -> die -> repeat over and over, the level layouts become less daunting. Remembering where to go and what to expect becomes second nature. Finally reaching a lantern and gaining that foothold further into enemy territory is the ultimate reward for perseverance. Like all the souls games, Bloodborne is full of ambiguity. 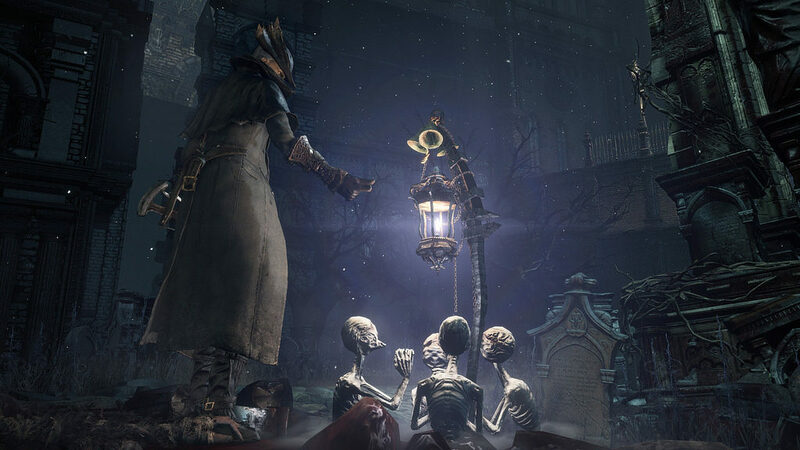 However, while the story of Bloodborne is somewhat up for interpretation, its level design is a near perfect system, holistically entwined with the very core principals that make these games great. This entry was posted in Level Design on April 28, 2016 by whipwrek. Working on the Crysis series, I grew a deep appreciation for games that allowed me to approach combat encounters at my own pace. 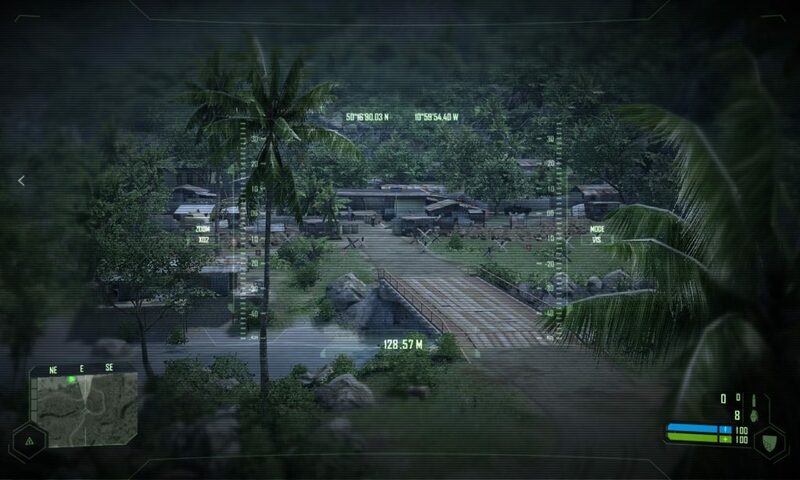 While I’ve always enjoyed games like Thief and S.T.A.L.K.E.R., actually developing games like Crysis opened my eyes to the details laid down by designers to help players dictate their own strategies and tactics. One way to describe Crysis is that it’s a “pro-active” game. Players can scout the battlefield before alerting any AI, spot opportunities such as vents, explosives, ammo, mounted guns and then execute a strategy, hopefully successfully! 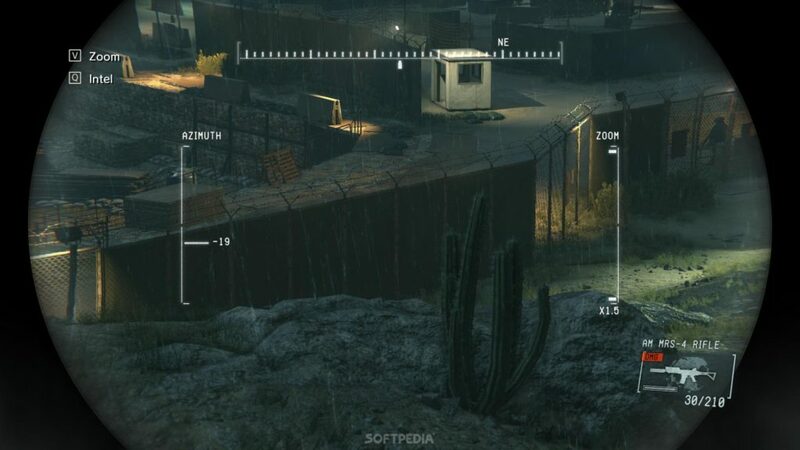 A vantage point or “recon” point where the player can perch and scout from. Sandbox opportunities that can be spotted from afar to flavour the encounter and present different gameplay options (vehicles, turrets, explosive barrels). Varied approach vectors. Having a single viable route into the encounter space would homogenize tactics, so often these spaces resemble multiplayer maps more than shooting galleries. Crossfire opportunities and multiple fronts. Building multiple fronts of defense into the space allows AI to react to the player in an intelligent way and make combat fun from multiple directions. Refuge spots and interior cover. Allowing the player to catch their breath or get some cover in a pro-active sandbox space is crucial as things don’t always go as planned. Usually we associate pro-active encounters with stealth, but pro-active gameplay doesn’t have to be the core experience of the overall title. 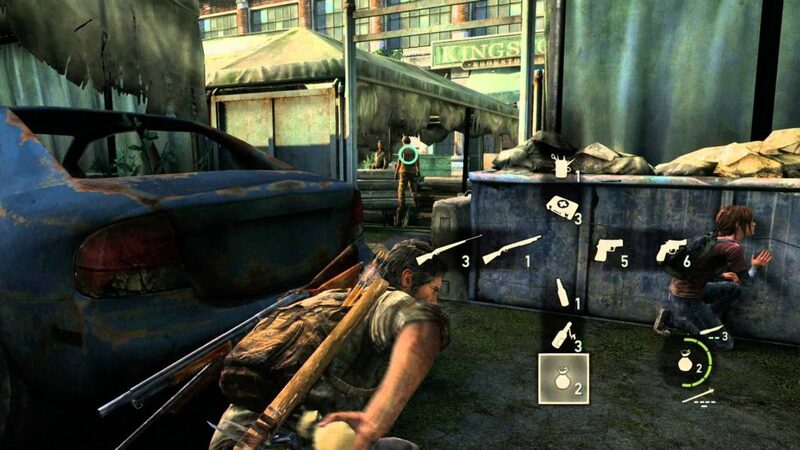 The Last of Us, for example, has many varied encounter spaces, both pro-active and reactive. Knowing what kind of encounter to build relies heavily on the title you are developing as well as the pacing and emotional intent of the encounter. Pro-active spaces can promote empowerment as well as help increase a sense of tension. Pittsburgh book store, example of pro-active combat. Hanging out in Bill’s Town, example of reactive combat. The final ingredient I want to mention when developing a pro-active encounter is also the most important one: the enemies. The ability to track not just an enemies movement and location but their intent can assist greatly in developing an exciting pro-active space. Seeing enemies do something contextual, behaving as though they are aware of the space they inhabit can help push decisions and tactics in specific directions and helps engage players massively. The Arkham series of Batman games uses the idea of Batman as a “predator” in its core gameplay formula. Mixed with enemy AI that reacts to the player hunting them, it produces a very satisfying “pro-active” gameplay loop. Many of the mechanics in the Arkham games support the premise that Batman is a tactician and surgically dismantles his opponents by executing well planned tactics. 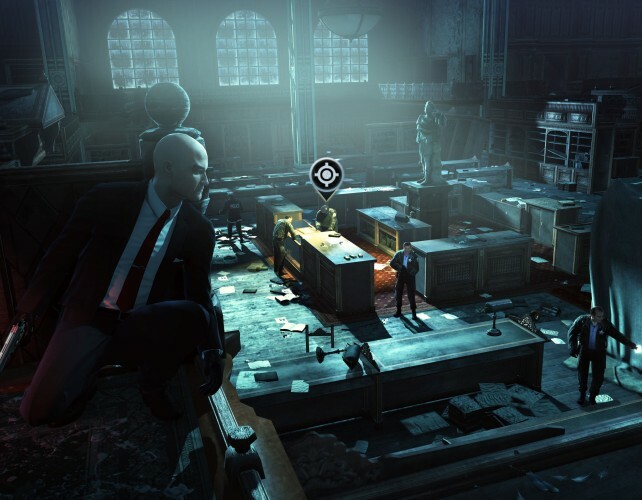 Hitman has also done this very successfully and it does a wonderful job of telegraphing enemy intent. 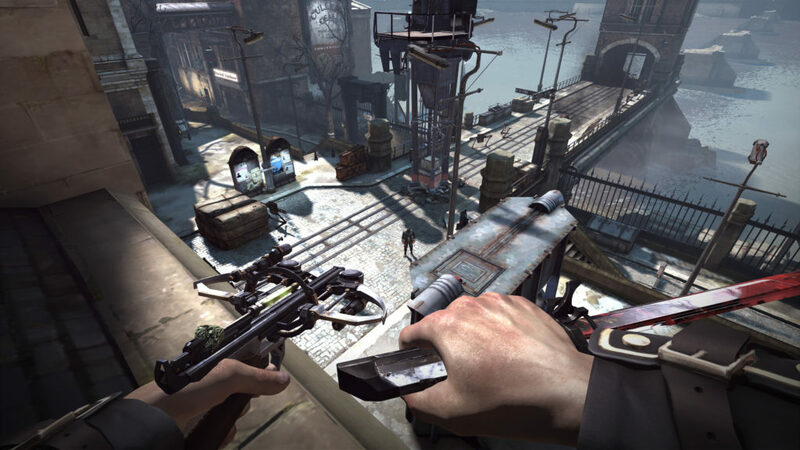 Often enemies will call out movements and reference objects in the environment to create a real sense of place, as well as helping the player decide upon a strategy. Using these techniques, level designers can create encounters that put players into the driving seat and find approaches that suit their own personal play styles. This entry was posted in Level Design on April 20, 2016 by whipwrek. As level designers, the locations and environments we develop can be influenced by a number of factors. When choosing a location to develop (something I will go into more detail on in a future post) level designers have to balance a variety of factors, such as story, budget, scope and schedule, and make a decision that will be best for gameplay and, ultimately, best for the game. Sometimes, however, we don’t get the luxury of choosing our locations or to develop a location from scratch. While most level designers (well, most I know) dream of developing the ultimate, balanced space that makes core mechanics shine like diamonds, sometimes it’s just not possible…or even desired! 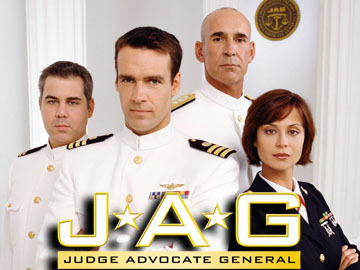 “J.A.G.” was, initially, a mostly derogatory term my team and I coined while working on previous projects. It stood for “Just Add Gameplay”, and it was our way of describing a space that, for one reason or another, had slipped through the cracks of traditional level pipelines and showed up on our doorstep, usually with the instruction that we were to “just add gameplay to this space” i.e. don’t change this space just make it work! As I mentioned, this is something we initially reacted to with steep opposition. How could we, the infallible level design team, not prepare each and every space with meticulous metrics and flow? How could we deem a space worthy that had not been processed and prepped? It took me longer than I’d like to admit that the answer could be simple: context. To give a space context in this regard is to give it a setting, or a theme, such as a space station or a hydroelectric dam. The context of a space is one of its defining attributes, particularly in story driven games. It gives meaning to the space and helps shape gameplay in equal measure with more mechanically focused construction methods. A level designer could build the most perfectly balanced environment for something like a combat encounter, and still feel that missing hook that only comes with context. Once that environment becomes a palace or a prison or a jungle, it gains a variety of attributes that are impossible to include in a simple “blockout”. These attributes can craft emotion and help create a connection between the player and the place they inhabit. 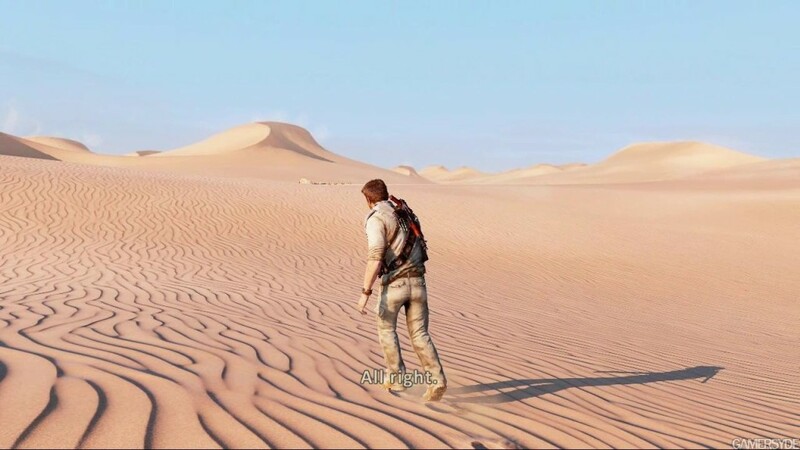 Some examples of spaces in my favorite games that make great use of their context: the desert in Uncharted 3 when Drake is searching for water is used to craft the feelings of fatigue, disorientation and hopelessness. 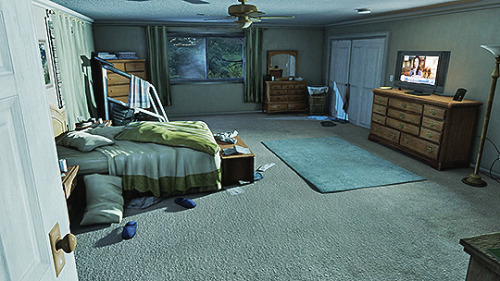 Joels house at the start of The Last Of Us creates a sense of familiarity, nostalgia and comfort before everything falls apart, enhancing the drama of the outbreak. The context drives these spaces and experiences, enhancing the emotion at each point. This does come with one caveat however; the gameplay you “jag” into this space must assist that context. You’ll rarely get your best combat encounter or puzzle from an area you inherit this way. Instead, we need to make efforts to use these spaces to create experiences that utilize the location fully. Now, it’s common that level designers begin by knowing the context of their environments already, whether original or real-world locations, as creating a blueprint for development is a key part of any level development process. You can’t build space stations on mars in your grounded post apocalyptic survival game. However, sometimes all you have is context. For example, in Crysis 2 we had several levels set in and around famous New York landmarks. 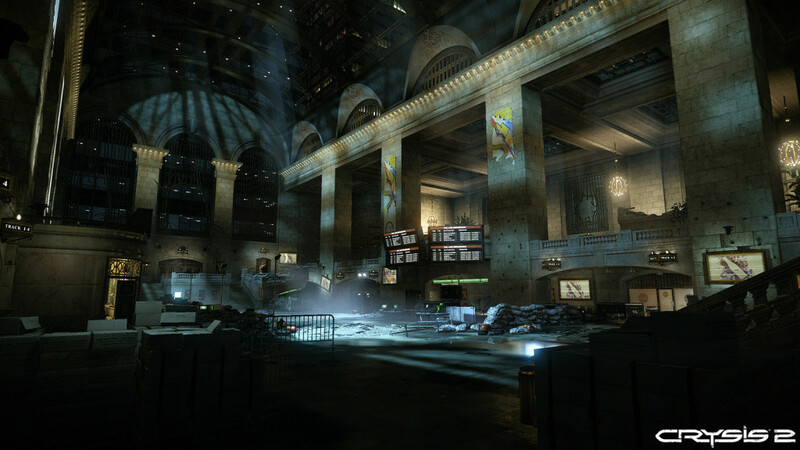 One environment that we knew would be in the game was Grand Central Station. It’s iconic and it helps foster that connection to New York that even people who don’t live there understand. It’s important. 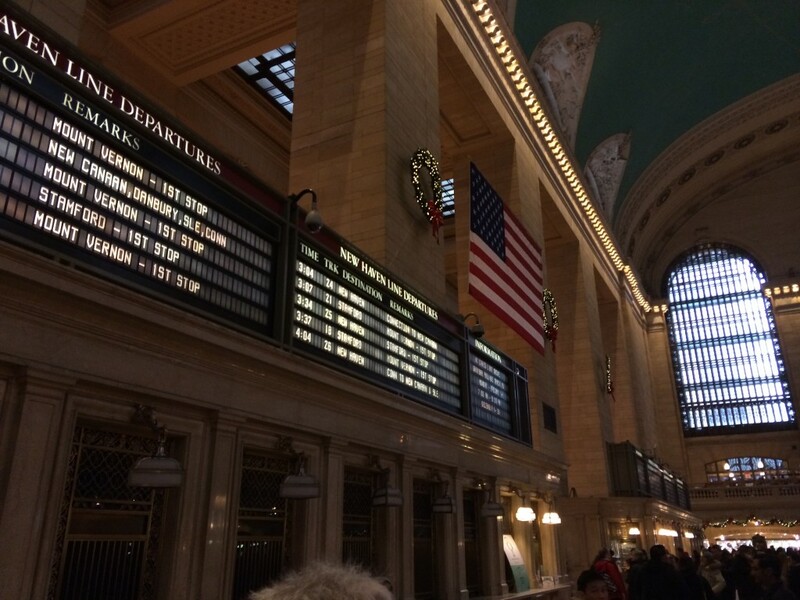 While the interior was changed slightly, it could not go beyond being recognized as Grand Central Station. The context of the space was the primary focus here, not creating an arguably perfect layout. Essentially, the gameplay chosen for this environment fit the context, not vice versa. 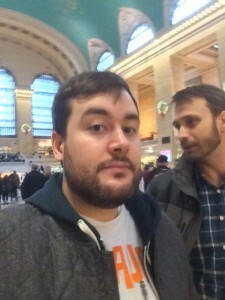 Grand Central Station taken by yours truly on a trip to NYC! At one point or another, we will be asked to take reference from a location or a concept that should remain untouched. Instead of resisting, we should look for what the context of the space can do to enhance the experience. Is the location nostalgic? Is it exotic? Is it recognizable? Does it create a sense of familiarity and connection? Ideally these locations are inserted into your game at key points, to get the maximum benefit from their inclusion. Often, these elements can produce experiences of equal value to those created solely by the rules and metrics of the game you are developing. This entry was posted in Level Design on April 12, 2016 by whipwrek. 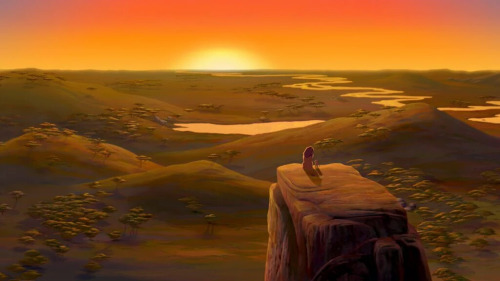 One day, Simba, you will reset all the outposts. The current generation of gaming has seen a prolific increase in open world and sandbox experiences. I list open world and sandbox separately as a game can host a linear narrative and level structure while still retaining large sandbox levels, such as Bioshock, Dishonored, Halo or even the more recent Tomb Raider games. Within each new title that explores the realms of open design, we can observe familiar techniques and traits that each developer is drawing upon to refine each experience. While level designers have more real estate to play with, these techniques are no less refined or considered than those of their more confined counterparts. The language of the landscape is often the most consistent element across many of these games, particularly because most open world and sandbox titles favor natural or rural landscapes. Just Cause, Far Cry, Shadows of Mordor and Metal Gear Solid: V, to name but a few, all feature similar principles of level design. For example, within each title, players can find pockets of what’s known as “refuge space”, a term coined by British geographer Jay Appleton, where they can lie low, take shelter or defend themselves from predators (particularly predators with long range weapons!). 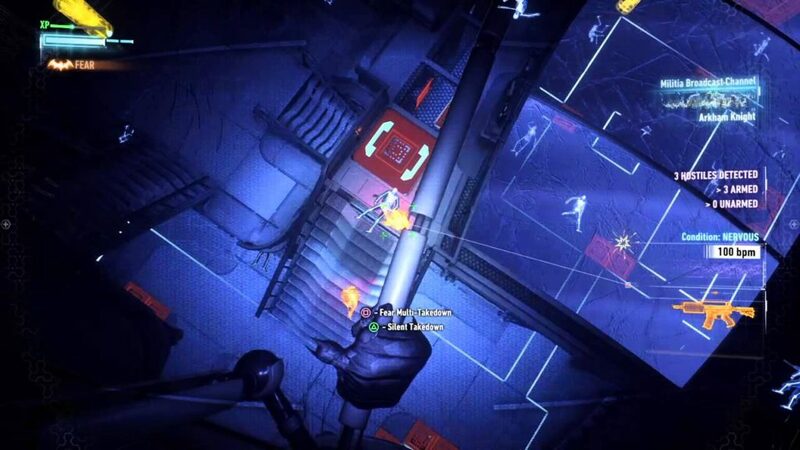 Refuge space is incredibly important, particularly in stealth games where the player character is a lot less durable and relies on the clear positioning of such spaces in order to progress across the open. Refuge space has also adopted a particular expectation within the context of gaming as a location where pickups and useful items may be found. It helps focus players on a goal, gives them a location to explore as well as often rewarding them for exploring. The building in the distance stands out as a clear point of refuge. In The Experience of Landscape, Appleton refers to open space as “prospect space”. It’s easy to understand why it is labelled so, especially as an avid game player, when you consider that such space is characterized by its offering for opportunity. I believe this is why most E3 presentations for open world games use the classic “see that mountain, you can go there!” selling point. Mr Appleton’s theory was that humans would crave refuge space when faced with prospect space, as opportunity is also partnered with danger. You risk being spotted by hunters, you risk the elements and you require something around which to orient yourself or risk getting lost. 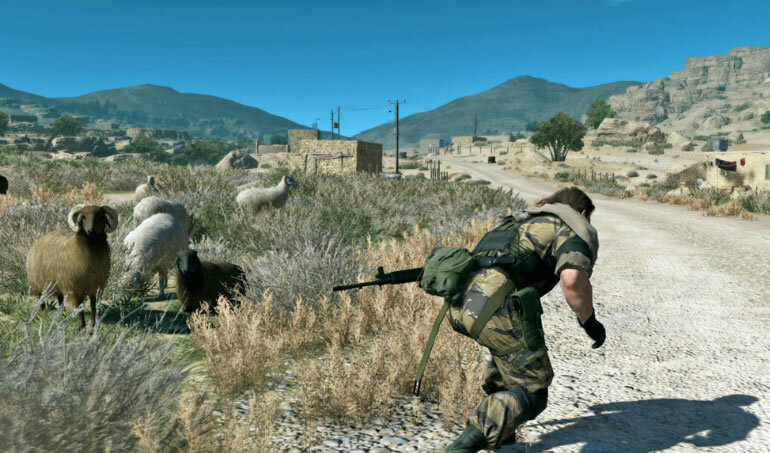 All these themes are prevalent throughout open world titles, and in particular Metal Gear Solid V makes excellent use of all three, with snipers, sandstorms and open plains to explore. I also have to make mention of one of my favourite open world games of all time, Red Dead Redemption, and how Rockstar utilize the draw of opportunity throughout the landscape design. Having rocks and undulating terrain not only helps technical performance by reducing draw calls, it also creates a sense of exploration and pulls the player to distant locations. “What’s around the next corner” type curiosity is a very powerful emotion in open world games. 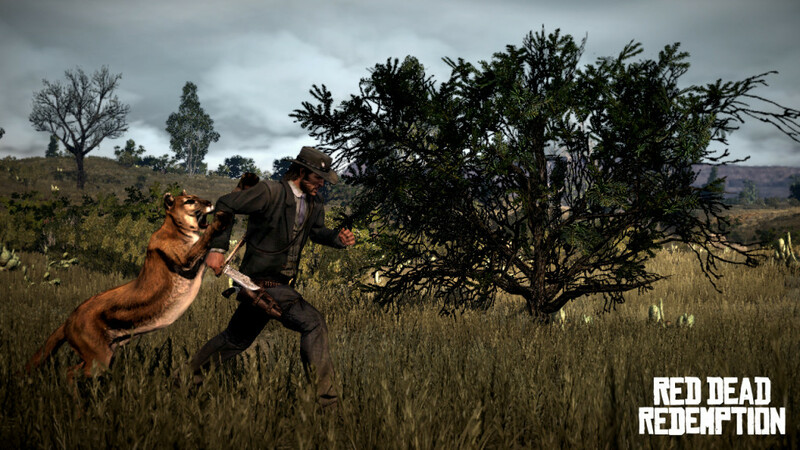 I believe it is the draw of the unknown and the true nature of prospect space apparent in Red Dead Redemption that distinguishes it against, for example, titles such as Assassin’s Creed. Assassins Creed can sometimes forgo the draw of the unknown to present a map full to the brim of icons and events, leaving little to the imagination in favor of presenting a world full of activities. 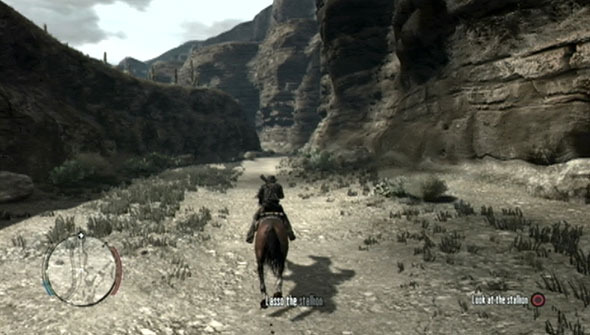 The world map in Red Dead can often be ambiguous, with nothing but a question mark to send you galloping across potentially dangerous open ground. The prospect of death by cougar. While open world games continue to get larger and longer, tried and true techniques and principles can help create the foundation of a game that speaks not just to gamers, but to the nature of human aesthetics. At least, that is, according to Jay Appleton. However I feel there is sufficient evidence within games such as Assassins Creed, Red Dead Redemption and even Batman: Arkham Knight, which subverts the typical “cave like” refuge space to extend to perches and high places, to suggest that these theories have merit. This entry was posted in Level Design on April 6, 2016 by whipwrek. I had the privilege of talking about the level design of Star Citizen at PC Gamer Weekender which you can view here. I also answered a few questions about the game and other design focused things on the webcast! This entry was posted in Uncategorized on March 31, 2016 by whipwrek. A long Easter weekend gave me some time to reflect on one of my favourite games from last gen, Mass Effect. Not only is this one of my favourite RPGs of all time, it’s also one of the most satisfying third person shooters I’ve ever played. I suspect much of my enjoyment from the shooter aspect of Mass Effect (at least from #2 onwards) comes from the class I chose to play: Vanguard. The mix of control biotics such as throw and lift combined with the specialized shotgun talents made them a real joy to play. 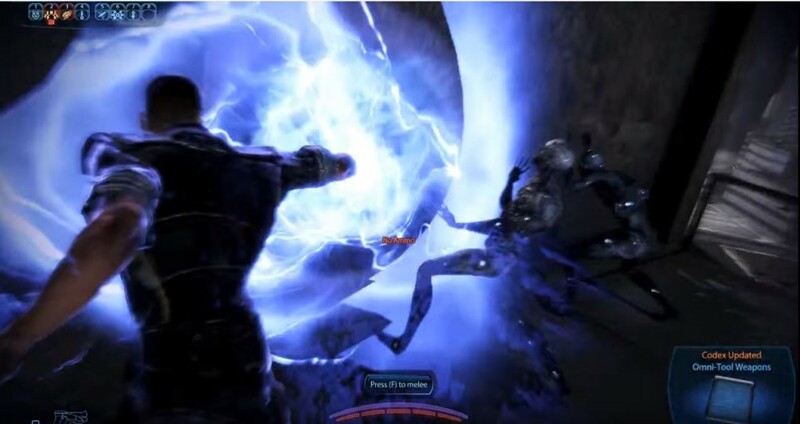 For anyone unfamiliar with Mass Effect, these abilities would basically trap enemies in a stasis field, usually making them float through the air. “Throw” in particular is basically a sort of energy ball you hurl at enemies like a homing grenade. When it hits an enemy, they are trapped in a bubble for a short duration. I remember discovering the ability to arc a “throw” around cover really opened the game up for me. As a cover based shooter, this ability made me feel clever and allowed me time to gap-close for a CQC knock out. It was a great way that Mass Effect set up rules of play then gave players abilities to subvert those rules. Being able to knock enemies out of cover and trap them in stasis while I run (or warp!) up to them for a shotgun kill felt incredibly rewarding. The class as a whole feels like one of the most fully realized and well developed classes in the game. Being able to pair up with an Infiltrator and a Sentinel makes for the ultimate in team synergy. It’s a testament to the team at Bioware that the various combat arenas throughout the game can support so many styles of play. By establishing a strong foundation (elements of Gears of War are very apparent, especially from ME2 onward) players can focus on abilities that open up arenas into little sandbox challenges. While the environments are not exactly dynamic (beyond the odd exploding barrel), I appreciated that the level design tends to be straightforward and not convoluted. 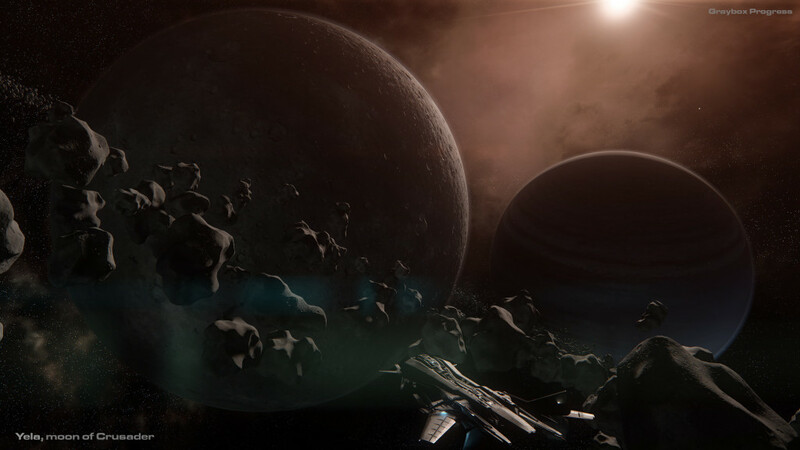 It would be easy to let the sci-fi setting generate a bunch of contrived spaces (and indeed one of the most frustrating combat environments in the series is one of the more fantastical: the exterior of the Shadow Broker’s ship in “Lair of the Shadow Broker” DLC for Mass Effect 2) but on the whole levels take a back seat to the spectacle of player abilities. In this way, player’s don’t need to wrestle with learning complex environment layouts and can focus fully on playing their class. Battling on the exterior of the Shadow Broker’s ship can be somewhat confusing. 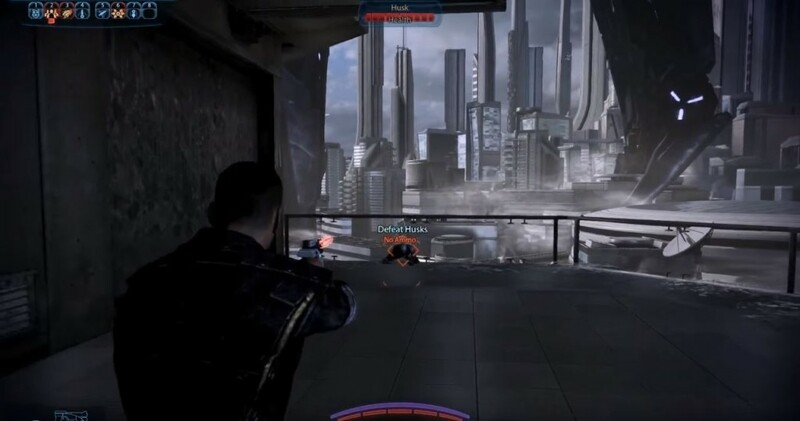 Another area where Mass Effect succeeds greatly is in tutorialising its combat. 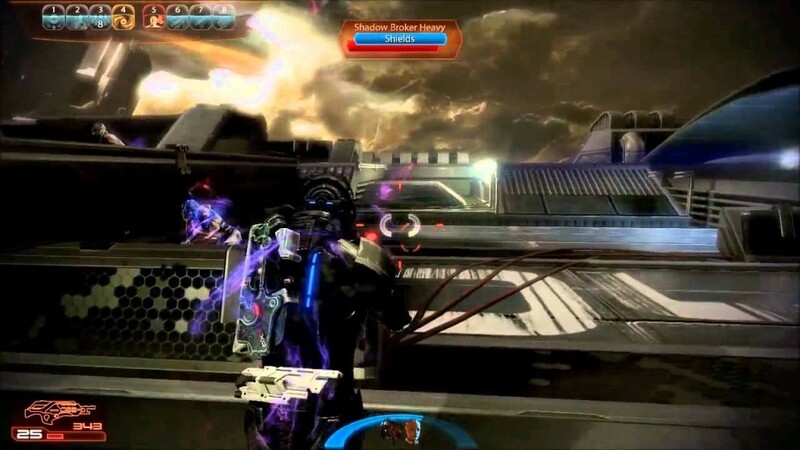 Mass Effect 3 in particular has a great intro that melds cinematic spectacle with intuitive mechanics introduction. The initial combat encounters are very straightforward, all enemy approach vectors (the direction the enemy travels toward the player) are kept to a minimum (all enemies are on a single plane in front of the player) to ease players in to combat. In fact, the first wave of enemies are “husks” that are mindlessly trying to break in to a building, ignoring the player. This allows the player to get to grips with the shooting mechanics in a controlled, almost stress free environment. (The tempo is kept high with the background destruction vignettes while the tension of the encounter is low enough to allow the player to concentrate). 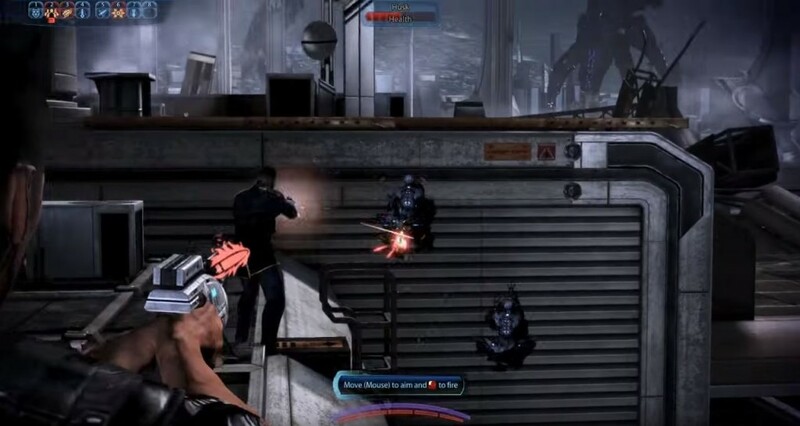 Another benefit of this encounter is that the player is forced to use their gun, as most biotic powers are out of range for these enemies. After dispatching a few husks, the player gets to try out their biotic powers/melee abilities furthering their tutorial for combat. The game achieves this by “hacking” the weapon ammo to run out just as you open fire on the enemies at the next encounter. A simple trick used to great effect (as a side note, check out all the games that hack ammo in some way right at the start of the game!). The final encounter in this sequence finally introduces a real threat to the player, allowing them to use what they have learned to overcome a small challenge. This cements their learning process and helps keep the tempo and tension of the narrative flow high. The approach vector of this enemy is still kept simple to keep the challenge at an appropriate level for this stage in the game. The enemy is also given plenty of foreshadowing through its reveal, by climbing up onto a ledge right in front of the player. Had the enemy leaped in from above or had another spectacular reveal, this may have startled the player or distracted them from the task of remembering how to dispatch the enemy. After dispatching this enemy, the player gets rewarded with an exhilarating cutscene of a reaper wrecking Shephards day by destroying earth. Great pacing and overall a fantastically crafted third person shooter! This entry was posted in Level Design on March 28, 2016 by whipwrek. I managed to get another blog post featured on Gamasutra. This entry was posted in Level Design on March 25, 2016 by whipwrek. I picked up Tomb Raider this week after finding some time outside of work to play it. 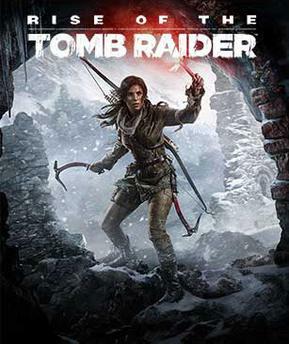 I loved the rebooted Tomb Raider and found it had lots to offer in the way of interesting level design. 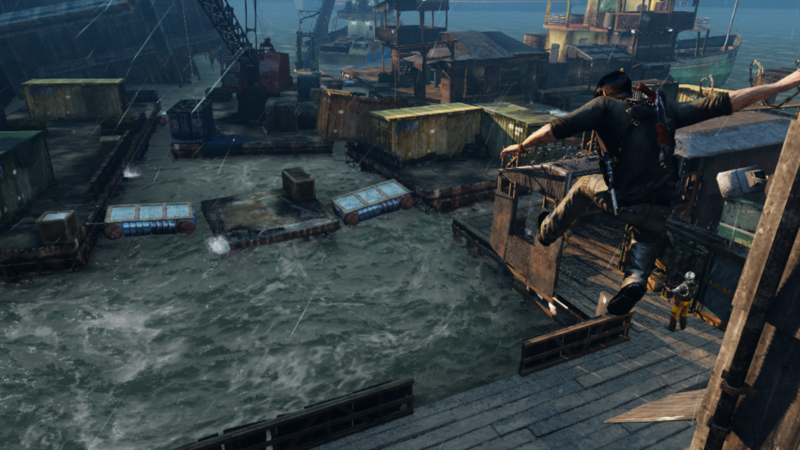 I was immediately aware of just how much Crystal Dynamics love “the gap”, or rather the bait and switch platforming which seems to have been made famous particularly by Nathan Drake across the Uncharted series. I was only about 2 minutes in before the mountain I was traversing started to explode around me, sending me scrambling for a foothold only for it to collapse away yet again. It’s put to good use here, kicking off the game with some nice high-tempo rock climbing sets the pace well for what I hope will be another gritty, hub-filled action platformer. The previous game in the series was a great way to spend a weekend; solid and polished. 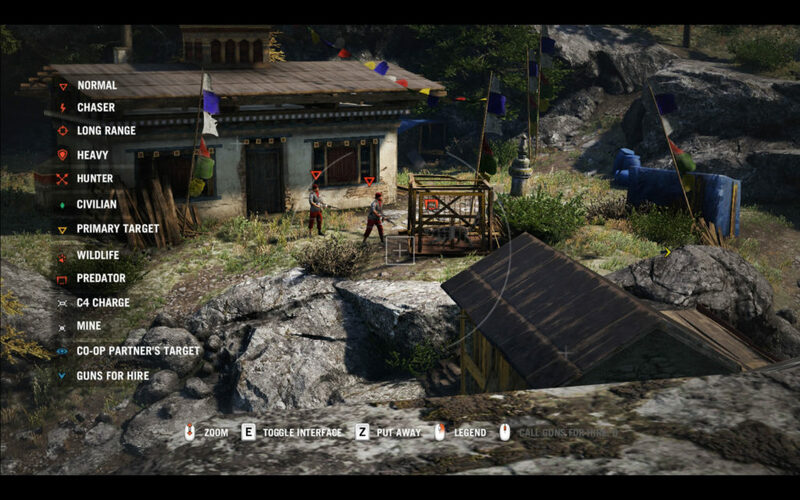 My favourite aspect of this rebooted Tomb Raider series are the well crafted “level hubs” that pad out the campaign. They have a very satisfying loop to them, with some great challenges, verticality and almost Zelda-esque unlock path that broadens out as you acquire new gadgets and abilities. The first of which I encountered in “Rise of…” has a satisfying ramp up speed giving me a relaxed pace at first, allowing me to hunt and get those first few upgrades, then introducing enemies just as I’ve made note of all the great little perches and flanking spots. 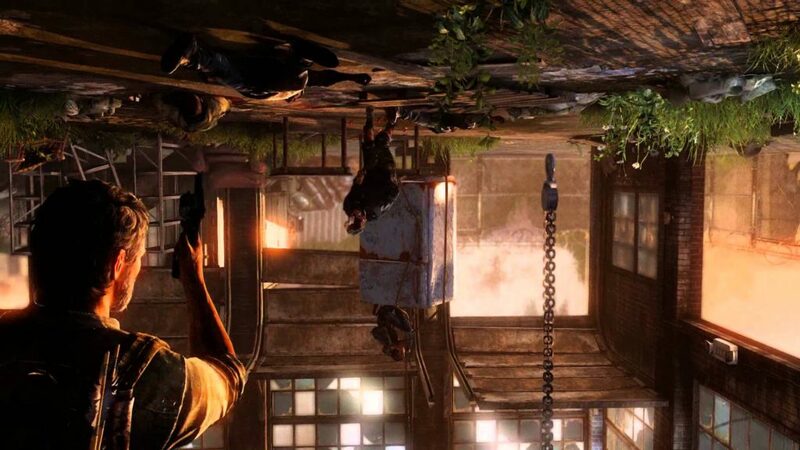 The game is also making the most of its smooth controls (at least, on PC) and enhanced vertical mobility via the climbing picks, rope slides and well positioned mantle points. I’m excited to see if these feature more in combat bubbles moving forward. A great introduction to the game so far, looking forward to the rest! This entry was posted in Level Design on March 22, 2016 by whipwrek.